Previous ArticleWhen will the government’s new White Paper ‘Fixing our broken property market’ impact on landlords? 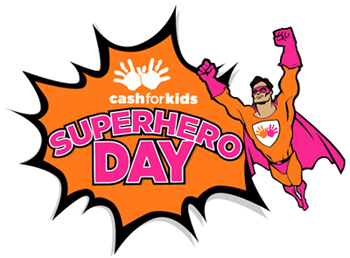 As headline sponsors of this year’s Cash for Kids Superhero Day, our branches in the North have been busy planning their local fundraising events, find out find out how you can support our branches, make donations and join in the fun below. What is Cash for Kids? Cash for Kids is Bauer Radio’s network of local charities, which operate across 22 areas around the UK. If you have been listening to the radio recently you may have heard the announcements in support of the day on Hallam FM, Key 103, Metro Radio, Radio Aire, Radio City, Rock FM, TFM and Viking FM. Every year Cash for Kids raises millions of pounds for local children and young people aged 0-18 who are suffering from abuse or neglet, who are disabled and have special needs or who simply need extra care or guidance. Last year collectively Cash for Kinds raised over £21 million in 2016, supporting more than 560,000 local children. Ahead of the big day on Friday 5 May 2017, our branches have been busy and are off to a flying start by raising just over £585 already! "On the 02 April 2017, I will be running the Liverpool Half Marathon, and although I do a few of these types of events throughout the year, it’s very rare I ever help others benefit by raising sponsorship for charity. This time I am hoping to raise lots of money for Cash for Kids knowing that it will help make a difference to local disadvantaged and disabled children in our community. Running for such a great cause, will certainly help me complete the miles in good time, so please dig deep and donate". Within the branch we will also be running a raffle as we get closer to Friday 5 May 2017 with a collection of prizes kindly donated by local businesses. Senior Branch Manager - Mark Latham has the whole family involved! "My 12 year old daughter is going to bake cakes, which we will sell in the branch for a donation; we are planning to bake every Thursday night with a view to selling our cakes over the weekend. So if you are passing, do pop into the Wilmslow branch and purchase one or two cakes for this great cause!" On Friday 28 April at 19:00, Lisa and colleagues are inviting you to join in on their fun bingo evening at the Fulwood Conservative Club, Blackpool Road, Fulwood, PR2 3AE. With a fully licensed bar, cash prizes, raffle and more. Why not join in the fun by purchasing a ticket for only £12 a head. The £12 includes your bingo books and a hot pot supper, take a friend and head on down. All proceeds from the evening will be going to Cash for Kids. "We have such a lot happening to support this fantastic cause and Superhero Day in our branch, including a children’s colouring competition, and a raffle with prizes kindly donated by local businesses, we have so much more planned and will be releasing further details in the run up to the big day". "Keep looking back here for updates, but our first stop will be a 12 hour bikeathon outside our branch on the 30 March 2017, Fishergate, Preston. So please come down and show your support and if you can spare a few pennies or more to help with our fundraising, that would be greatly appreciated." It’s easy to get involved, pop into your local Reeds Rains branch where there will be further cake sales, raffles, colouring in prize draws, staff dressed up as superheroes, radio DJ’s and so much more…. If you have anything you would like to donate, or would just like to get involved our branches would love to hear from you. Don’t forget that every penny raised locally stays locally, so you can be sure your support will directly benefit a local child with a minimum of 80p from every pound donated going to the children. We will be updating these pages regularly with more information about our branches involvement in the run up and during the Cash for Kids Superhero Day 2017, so make you sign up for alerts here.